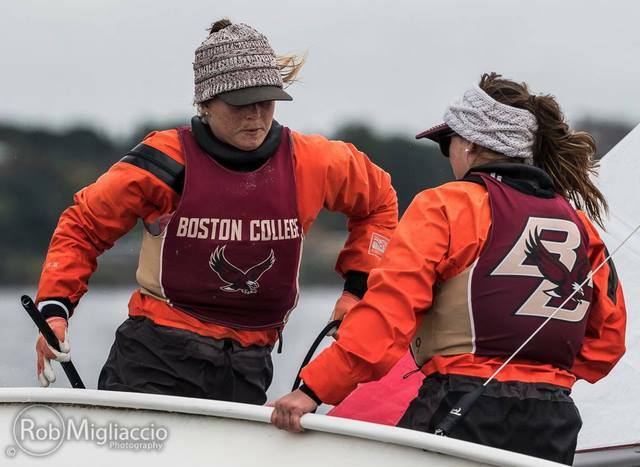 Great racing at the first ever College Sailing Women's Showcase Final at Brown! The event was sailed out of the Ted Turner Sailing Pavilion at the Edgewood Yacht Club in Cranston, RI. Saturday brought some rain and cool temps for the first half of the day and then the sun came out for a bit in the mid afternoon. Temps were in the 50's and it was a cold first half of racing. 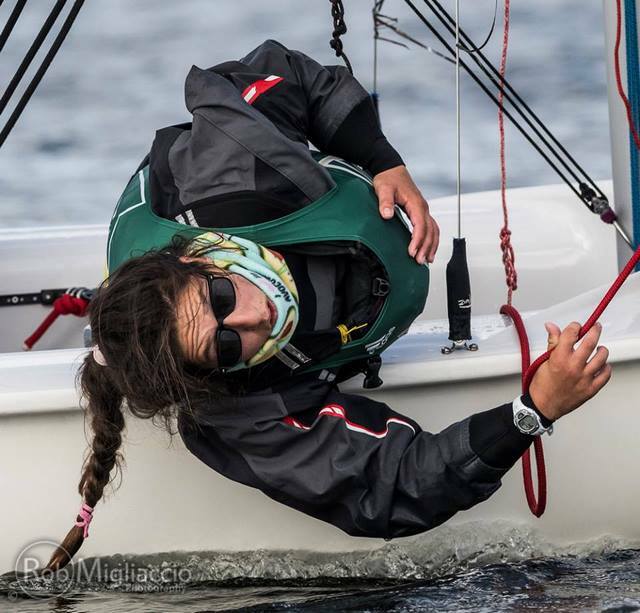 All races were in a mainly shifty westerly of 6-12 knots with big shifts in either direction. 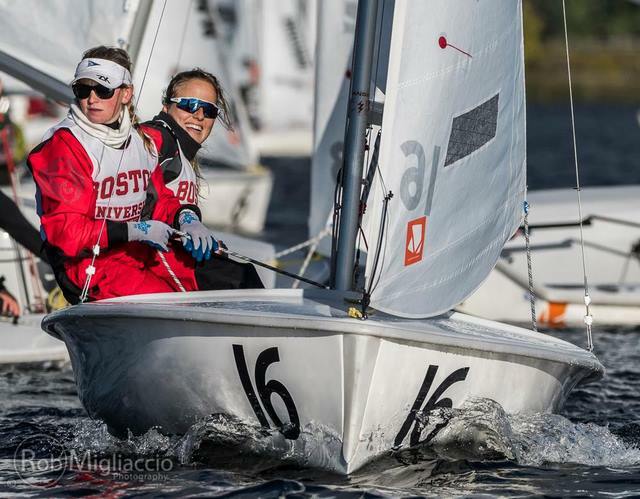 10 races were sailed on Saturday in each division with A-division in Z420s and B-division in FJs. 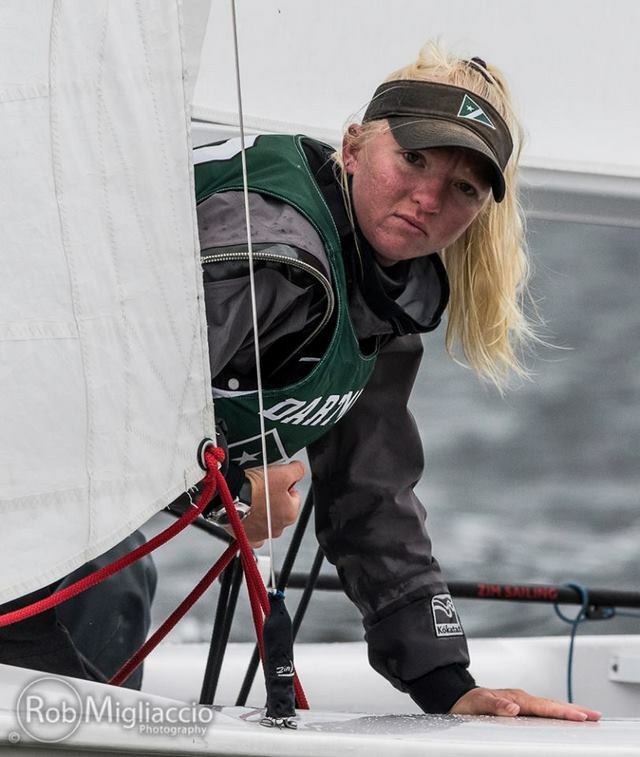 One DSQ was given to Hobart/William Smith in race 10A. Yale led after Saturday after a long day on the water. Sunday brought nicer weather but lighter and really unstable conditions to begin the day. 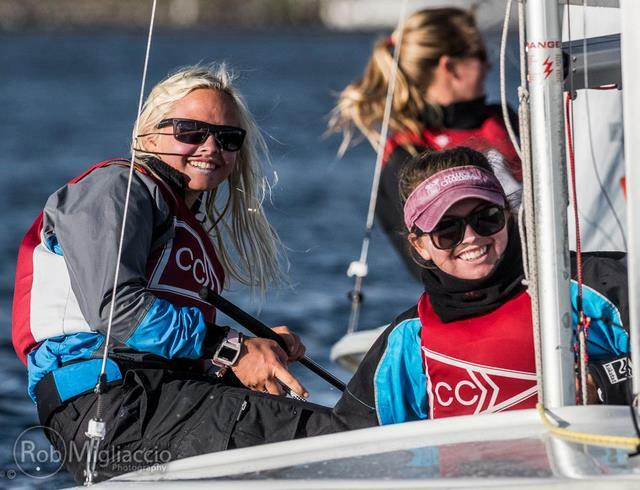 One race was sailed in each division before a wind delay and lunch break in another mainly westerly direction with big, long shifts in either direction. 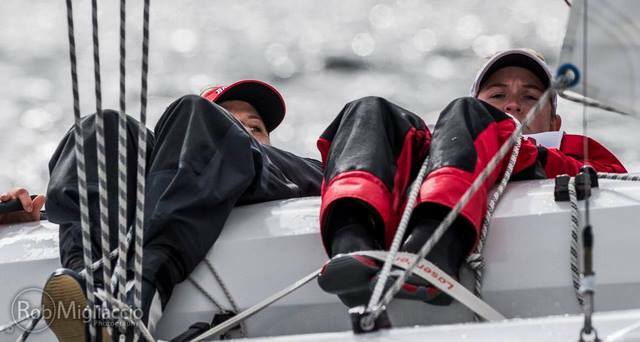 The breeze began to get better around 12:30 and three more races were sailed in each division after the break for a total of 14 races in each division. Again, it was a mainly westerly direction with big shifts and an average velocity range of 6-10 knots with a few bigger puffs. A lot of mark moving was done to try to keep up with the shiftiness. 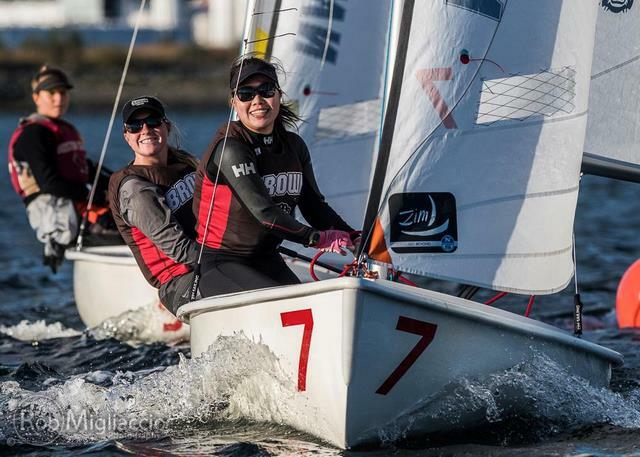 A-division sailed FJs on Sunday and B-division was in Z420s. All courses for the event were windward/leewards with 3, 4 or 5 legs. No protests were filed on Sunday and no breakdowns for the entire weekend. A huge thanks to our judges, all recent college graduates, for giving back: Sam Alexander (Brown 2018), Luke Andersen (Cornell 2018), and Quinn Andersen (Brown 2018). Thanks as well to coaches Chris Lash (BU) and Michael Zonnenberg (Brown) for hearing a protest on Saturday as well. Thank you to Coast Guard Coach Brian Swingly for being the ICSA Representative, all of the Brown sailors for their help with running the event, the Edgewood Sailing School for the use of their powerboats, and to photographer Rob Migliaccio for taking great pics of Saturday's racing that will be up on the NEISA Facebook soon. 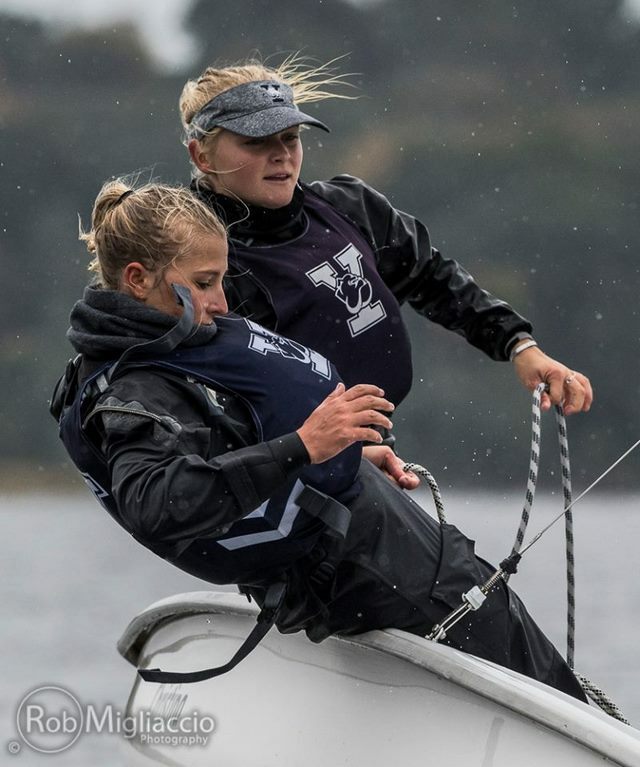 Congrats to the hometown Brown Bears for winning the first ever College Sailing Women's Showcase Final in the last race over Yale by two points. 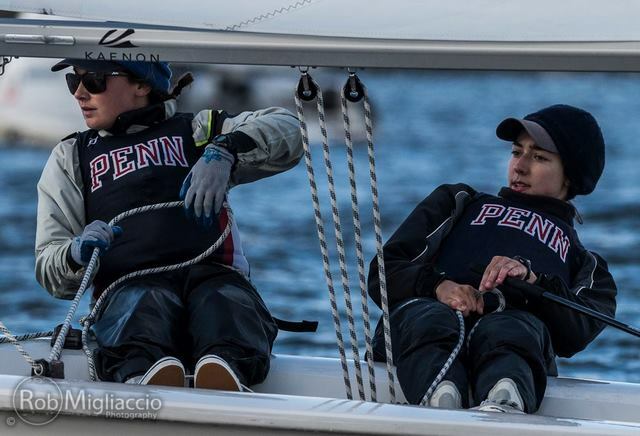 Louisa Nordstrom '20 and Graceann Nicolosi '20 from Yale won A-division with 75 points and Brown's B-division of Hannah Steadman '20 and crews Emily Ito '19 and Maxine de Havenon '19 won B-division with 78 points. MIT rounded out the podium finishing in third place overall.